A heartbreaking and poignant novel of grief and guilt that reads like Nicholas Sparks for teens! The plot elements in the book aren't really new- teenage/single parenting, senior high school stuff, moving on and family relationship. However, it was made somehow refreshing (at least for me) by the choice of voice and by weaving the main's issues together, making it easier to connect to the main character. Ryden is 17 and a single dad, juggling work and school, and is struggling to reconcile with his past. He really has a lot going on in his life. While reading, I was able to see his sorrow and struggle. But despite the many issues, the elements are played out such that my reading never got too overwhelming. The book did not focus too much on the love story, but on Ryden's development. It primarily deals with decisions and responsibilities, and I was able to see the reality in making choices, especially when the future is at stake. The reconciliation in the end, I think, is already expected as most books of the same category. I liked how the ending is quite open. A lot more can happen but there's hope, if not a certainty, of a good future. I loved how the characters are presented- flawed but relatable. I liked the dynamics of the characters, and how the character development of the main is slow yet sure. Though only through her journals, I was able to know Meg and how she affected Ryden. She had lapses in her judgement, but she definitely loved Ryden. It would actually be nice to read their story. And it would be a bittersweet read. Joni is the opposite of Meg. Though not explored well, her character played a big part in Ryden's development. From what I read, I can say that Joni is her own person. I liked how she stays true to herself, and how unique she is. I also enjoyed reading Ryden's interactions and relationships with Alan (Meg's best friend), Mabel (Meg's sister) and most especially, Ryden's mom. Alan, Mabel and Ryden would have been strangers if not for Meg. Though only until later, they were able to form a bond of friendship; and I liked how they supported each other. Ryden's relationship with his mom is just admirable. There's love and support, and they're like best friends to each other. 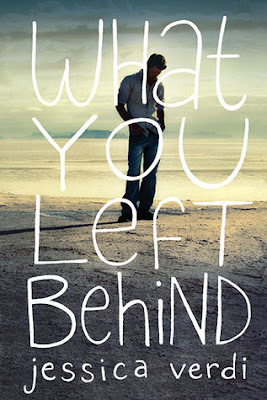 What You Left Behind is written in a first person voice, in Ryden's perspective. Though one-sided, I was able to know and relate not only to Ryden but also to the other characters. Despite the many issues thrown, the flow of the story is smooth and easy to follow. All the events are also relevant to Ryden's development. I especially liked how the "ugliness" of life was not downplayed. The author was able to portray the rough edges of life, but at the same time offer hope to the readers. My rating is 1 star short because of the cursing. (I'm not really comfortable with cursing.) Also, I was expecting to know more of Joni because I thought she's a main character as well. But other than those, I think What You Left Behind is a good read. I recommend reading this, especially if you're looking for a contemporary read about responsibilities, priorities, relationship and moving on. And I would definitely read the other books of Jessica!